Shrimp Scampi... I love ordering this when eating out at a restaurant, but I assumed it would be harder to make at home. I love to cook, but I'm the first to admit that I no chef. I prefer simple meals that don't require lots of cutting or time. 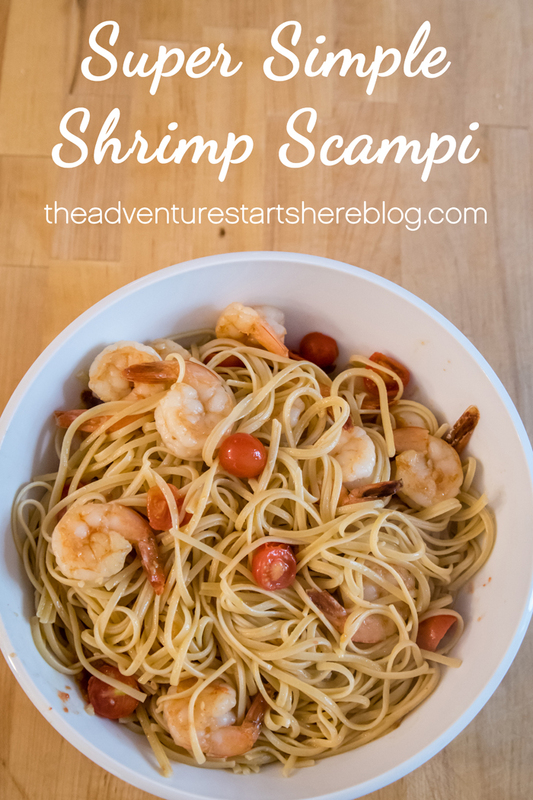 I was thrilled to find a shrimp scampi recipe that was not only easy but also pretty quick to make. The hardest/longest part of the whole process was prepping the garlic, and even that isn't really difficult! Heat up a pot of water, cook the linguine according to the instructions on the package. Sprinkle the cayenne pepper to the shrimp. Set aside. Heat up a saute pan and add the butter. When the butter melts, add the olive oil. 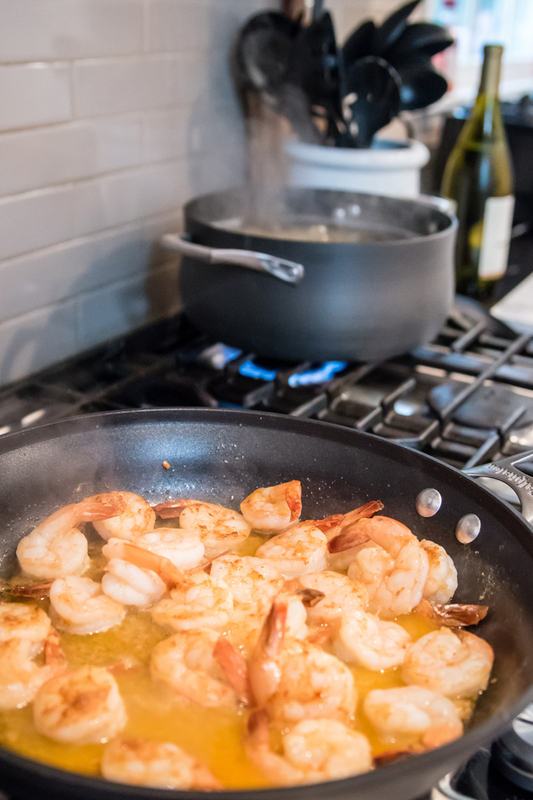 Stir in the garlic, lightly saute until aromatic before adding the shrimp into the pan. Saute the shrimp until half cooked and then add the white wine, salt, and sugar. Add the cherry tomatoes and linguine into the pot, stir to combine well. 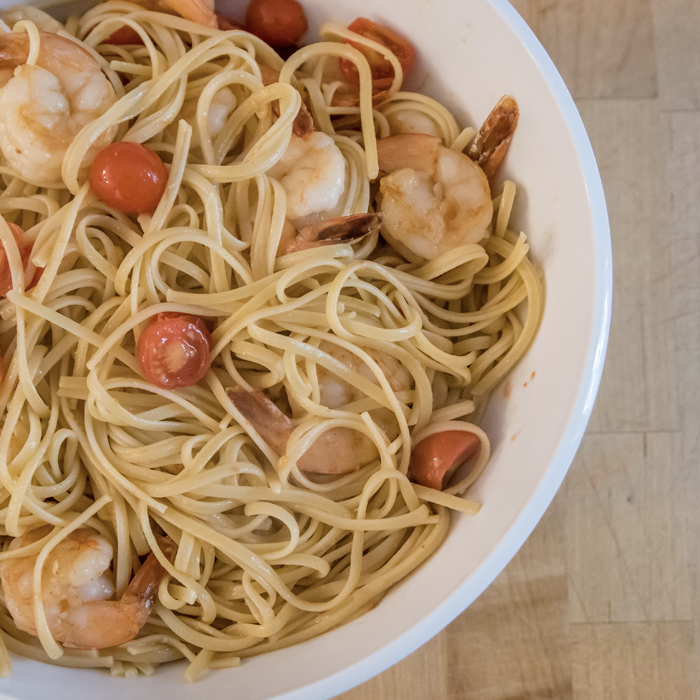 When the shrimp is completely cooked, add a few squirts of the lemon juice and black pepperto the linguine, toss to mix well, dish out and serve immediately with some shaved Parmigiano Reggiano cheese. I was so pleased with how this dish turned out. 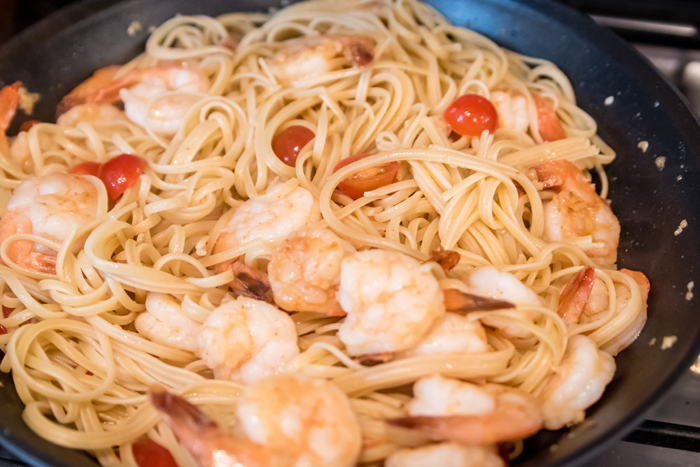 It doesn't take long to cook shrimp, so I suggest waiting to start that until your pasta is almost finished cooking. Once you have your tomatoes cut in half and your garlic minced, everything else comes together really quickly. I love pasta, but prefer lighter dishes for the warmer months, and this definitely fits the bill. And since it doesn't take long to make, you could easily prepare this on a weeknight even. Can't you just imagine enjoying this with a glass of wine out on your deck or patio??? This would even be a really good dish to entertain with. The shrimp makes it seem fancier than it is and since it's so quick to make, you could still enjoy spending time with your guests. Now you have no excuse not to have some friends over this summer! I'm linking up with Courtney, Liz, Sarah, and Whitney for Foodie For a Year. I can't wait to see all the summer recipes! Looks delicious!! I can't wait to try it! I haven't had shrimp scampi in ages. Since I am the only one who will eat pasta. Such a shame. Totally limiting on my meal planning =) This looks delicious! 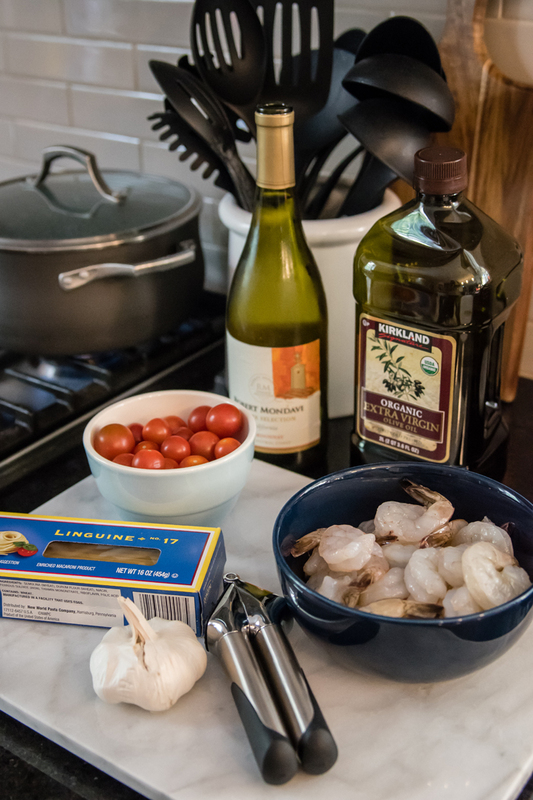 We're actually making shrimp scampi tonight! I love how simple it is to make. I'll have to try this recipe out next! Mmmm!! I love shrimp dishes for a quick meal if I forgot to thaw meat. I just need to time it better and NOT overcook the shrimp, ha!! Also, must get white wine to have on hand to cook with. This looks so good but my husband is allergic to shellfish. Womp womp. I would give anything to make this thought because I love me some shrimp! So yummy!!!! I wish Lily would eat shrimp! My husband and I love it!! This dish looks right up our alley! Quick, easy, yet looks super fancy!! If only I liked shrimp. Great photos friend! There used to be a frozen shrimp scampi sold at Costco that was to DIE for and they stopped carrying that brand yearsss ago, tear. I will definitely have to make this it looks delicious! I am sure this is delicious but I'll have to pass as I can not do shrimp or any seafood, really. I'm such a lame eater! I am not a seafood person at all, but this looks quite delicious!